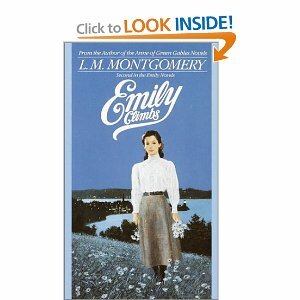 It is on my goal list of 101 in 1001 days project: to read the Emily trilogy by L.M. Montgomery. I absolutely *love* the Anne series and own all 8 books (Anne of the Island is my favorite). 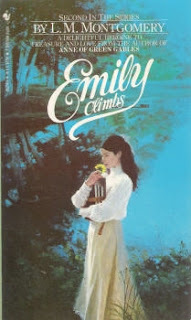 Anyway, I've only progressed to the 2nd book in the Emily series, but I made myself devour it slowly and thoughtfully. It is so beautiful and yet the plot is very simple. In Emily Climbs, it picks up from where Emily of New Moon left off. Emily is now 14 and her guardians have to make the decision whether or not to let her go to the high school in the bigger town of Shrewsbury. It means that she will have to board with her stern Aunt Ruth, who thinks everything Emily does is "sly"--quite hilariously. Aunt Elizabeth and Aunt Laura decide that Emily should go to the more academic high school in Shrewsbury to get her education. So, Emily goes to Shrewsbury for 3 years of high school. 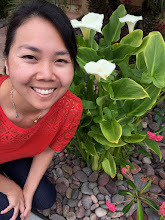 She continues to write poetry and short stories, citing many references to "climbing the Alpine path" up to the top of becoming an author/poetess. She submits her work endlessly to magazines and newspapers, even succeeding a few times. Meanwhile, she still grows up, her feelings growing stronger for her childhood friend Teddy Kent and her friendship with crazy Ilse suffering and enduring hardship. She continues to cause scandals, which are always unintentional where Emily is concerned, and learns to hold her head up high. Of course, she has to learn to live up to her reputation as a descendant of the authoratative Murrays. She is still enamored with nature and her love of the Wind Woman and P.E.I. never fades. The whole book was so bewitching that I loved every sentence...which says a lot because Montgomery does exposit in pages and pages about the description of trees and hills and wind and the moon. I think it's what makes Emily Climbs so good.